Home/Animals and Sound/Advanced Topics in Anmials/How did odontocete hearing evolve? Cetaceans evolved from ancestors that had air-adapted ears. Their entire body, including their auditory systems, underwent significant adaptations related to living in water. These include the shape of the skull, the formation of a pathway for receiving sound energy in water, and some components of the inner ear. The following movie shows the anatomical adaptations of the skeleton of odontocetes, from the oldest known cetacean to modern-day odontocete. A movie of the anatomical adaptations of the skeleton of odontocetes, from Pakicetus to Ambulocetus to protocetids to modern-day toothed whales. Movie provided courtesy of Darlene Ketten, Woods Hole Oceanographic Institution and Harvard Medical School. Gingrich and others (1983) published this reconstruction of the skull of Pakicetus inachus (redrawn for RNCSE by Janet Dreyer). Image credit: National Center for Science Education, Inc. (www.ncse.com). The oldest whale is from the genus Pakicetus, known from a 52-million-year-old fossil from Pakistan. It had four legs but is classified as a whale because its enlarged auditory bulla, has an enlarged, distinct tympanic wall, which is characteristic of modern whales. The next step in the evolutionary chain is Ambulocetus, discovered in 1994, which could both walk on land and swim. The skull of Ambulocetus elongated and included a fat pad in the lower jaw, which in modern-day odontocetes is the pathway for sound energy to reach the middle ear. Remingtonocetids and protocetids, the next steps in the evolutionary chain, were the first cetacean ancestors with an ear like that of modern whales. The movie concludes with a generic odontocete skeleton, showing an animal fully adapted to an aquatic existence. 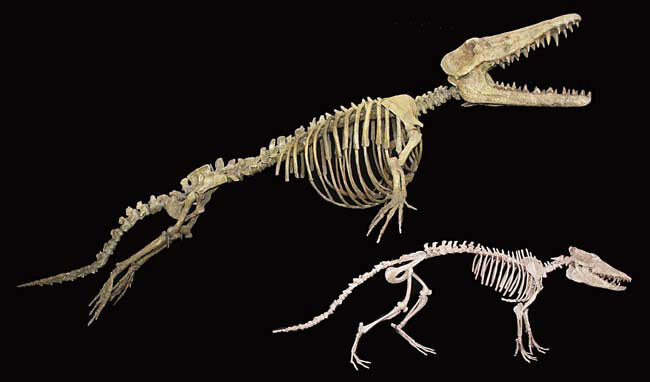 The skeletons of Ambulocetus (top) and Pakicetus (bottom). Image credit: Thewissen lab, NEOMED. The aquatic ear is highly derived compared to the ear of land mammals. Cetaceans have no external pinna and the ear canal is narrow and plugged with thickened tissue, dead cells, and wax. Sound gets to the middle ear of odontocetes through fats that surround a thin, hollow area of the lower jaw, or mandible. The adaptations of the inner ear for underwater sound reception are discussed in the section Hearing in Cetaceans and Sirenians, the Fully Aquatic Ear. Important differences between a terrestrial inner ear and the odontocete inner ear that are associated with echolocation in water are the number of auditory ganglion cells, the ratio of the number of ganglion cells to the number of hair cells, the size of the auditory nerve, the dimensions of the basilar membrane, and the support of the basilar membrane. These adaptations mean that odontocetes have a broad hearing range extending to 200 kHz, and they are able to do complex auditory processing. 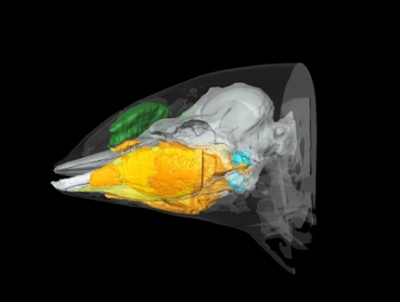 Three-dimensional surface volume rendering from CT scans of the head in left lateral view of an Atlantic white-sided dolphin (Lagenorhynchus acutus) demonstrating the position of the tri-lobed jaw fats (orange), melon (green), ear bones (blue), and soft tissues (transparent) relative to the skull. Image provided courtesy of Darlene Ketten, Woods Hole Oceanographic Institution and Harvard Medical School. Computerized Scanning and Imaging Facility at Woods Hole Oceanographic Institution: 2 dimensional and 3 dimensional CT scan images of cetaceans and other animals. Berta, Annalisa and James L. Sumich. 1999, Marine Mammals: Evolutionary Biology. Academic Press: 494 pages.